SAN DIEGO (NEWS 8) – Call it the small game ahead of Sunday’s big game. “We had the Patriots and the Rams squaring off,” said Dana Kreutzer, the director of operations for Paw Commons Pet Resort in Hillcrest. Friday morning the boarding and grooming facility held it’s 7th Annual Puppy Bowl. 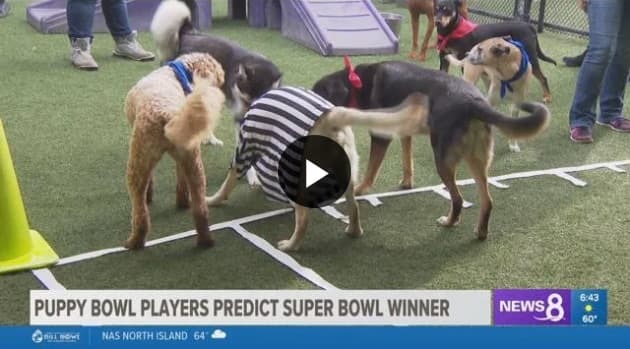 “The puppies have voted correctly for four years in a row so we’re excited to see if they predict the outcome of the super bowl this year,” she said. With the Rams in red bandanas and the Patriots in blue, the owners of these players made it very clear which team their dog should be on. “They [customers] literally walk in and say, ‘my dogs needs to be in the Patriot’s jersey or my dog needs to be in a Rams jersey,'” said Kreutzer. After that it was a dog fight to the end and when the clock ran out, the Rams came out on top with 17 touchdowns to the Patriots 13. And in a shocking Super Bowl twist, there was also a third-place winner, a white lab who was technically supposed to be calling the game. “The ref actually had 8 touchdowns,” Kruetzer said with a laugh.